Six medium-scale gravity waves (GWs) with horizontal wavelengths of λH=60–160 km were detected on four nights by Taylor et al. 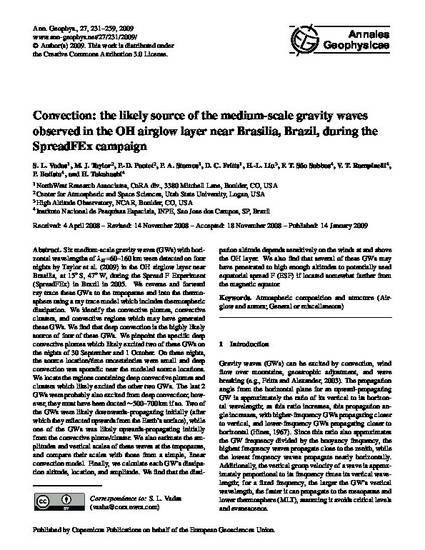 (2009) in the OH airglow layer near Brasilia, at 15° S, 47° W, during the Spread F Experiment (SpreadFEx) in Brazil in 2005. We reverse and forward ray trace these GWs to the tropopause and into the thermosphere using a ray trace model which includes thermospheric dissipation. We identify the convective plumes, convective clusters, and convective regions which may have generated these GWs. We find that deep convection is the highly likely source of four of these GWs. We pinpoint the specific deep convective plumes which likely excited two of these GWs on the nights of 30 September and 1 October. On these nights, the source location/time uncertainties were small and deep convection was sporadic near the modeled source locations. We locate the regions containing deep convective plumes and clusters which likely excited the other two GWs. The last 2 GWs were probably also excited from deep convection; however, they must have been ducted ~500–700 km if so. Two of the GWs were likely downwards-propagating initially (after which they reflected upwards from the Earth's surface), while one of the GWs was likely upwards-propagating initially from the convective plume/cluster. We also estimate the amplitudes and vertical scales of these waves at the tropopause, and compare their scales with those from a simple, linear convection model. Finally, we calculate each GW's dissipation altitude, location, and amplitude. We find that the dissipation altitude depends sensitively on the winds at and above the OH layer. We also find that several of these GWs may have penetrated to high enough altitudes to potentially seed equatorial spread F (ESF) if located somewhat farther from the magnetic equator.